How to Transfer Photo from iPhone to Computer without iTunes? With the popularity of Apple's idevices, mobile phones have entered a new era. And the resolution of its built-in camera has become more and more higher. Thus, many people like to take photos with their smart phones, especially for iPhone's user. Under this situation, it is undoubtedly that there are lots of photos existing in your iPhone, right? So have you ever wondered about exporting them to a computer for backup or sharing with your friends on the Internet? If so, you've been the right place. You can use iTunes to sync photos from computer to iPhone, but you can't use it to transfer picture from iPhone to PC. So you may ask "Is it anyway to export photos from iPhone to computer without iTunes? ", right? In fact, the answer is absolutely YES. In this article, we could like to recommend two different ways for you to copy photos from iPhone to computer easily. You can compare them and decide which one is better according to your own needs. Every time you connect a device to the computer via USB cable, there is a pop-up window will appear and asking you what you want to do, right? In this way, you can successfully export photos to PC as you like. 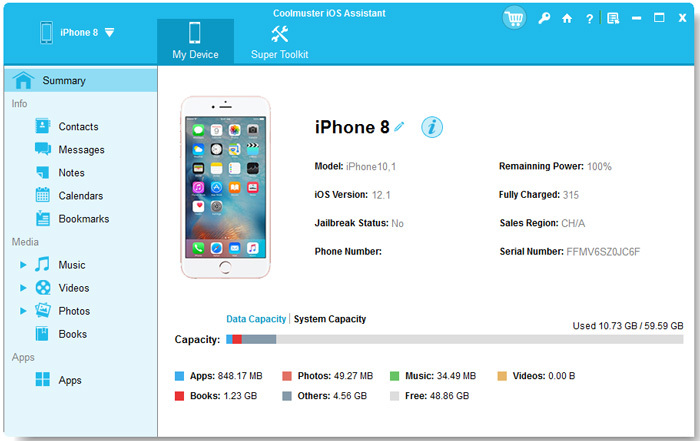 - Connect your iPhone to the computer without iTunes running. - When the pop-up appearing and asking you what you want to do with the device, just select "View Content". - Find photos through the folders that are displayed and copy them as usual. 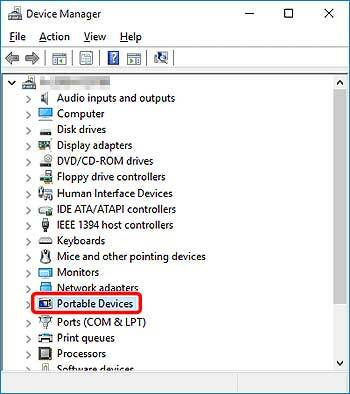 One thing you need to be noted that iPhone always can be mounted under "Portable Devices" and be found listed under "Digital Camera" in Windows 7 and Windows 8 systems. Undoubtedly, this method is very easy to handle, but it is not working well at every time. Sometimes it will require minor navigation within the folder to copy the files. So we highly recommend you to use the second method to transfer pictures from iPhone to PC. To transfer photos from iPhone to computer or from computer to iPhone, you can actually enable Photo Stream feature on your iPhone device. - Go to Settings > iCloud > Photos. - Then turn on My Photo Stream. - Open iCloud on your computer. - On the iCloud Control Panel, enable Photo Stream option. - Now, import photos to Photo Stream folders on your phone. Then these files will be uploaded to iCloud. Then, you are free to view these photos on your computer as wanted and needed. And if you want to transfer photos from computer to iPhone, just follow the similar steps to export photos to Photo Stream on computer and then go to Photos app on your iPhone device. If you're searching for "transfer photo from iPhone to computer" or "transfer photo from computer to iPhone"on the Google, you can get unlimited answers from the Internet. And a majority of these solutions will mention a practical iPhone to Computer Transfer tool. 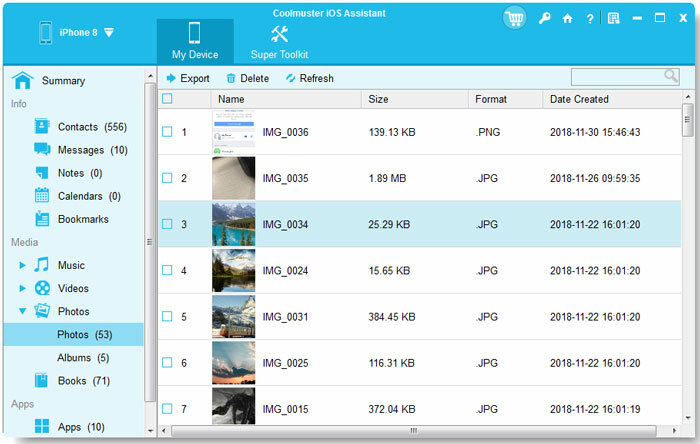 Of course, there are many choices but if you want to find a reliable tool to ensure your computer and device's security, then you can't miss this iPhone Photo Transfer - Coolmuster iOS Assistant. It is fully compatible with almost all iPhone devices, including iPhone X/8 Plus/8/7 Plus/7/6s Plus/6s/6 Plus/6/5S/SE and more. Now, get the free trial version of this powerful iPhone Photo Transfer by clicking below icons. Then follow below instructions to start your own transferring journey. 2) Choose "Photos" in the left and you can preview the pictures in the right panel as you like. 3) Find and mark all pictures you want to transfer, and then click "Export" button in the top of the panel to start exporting photos from iPhone 5/4S/4/3GS to computer. Done! And if you want to transfer photos from computer to iPhone, just hit the Import option, navigate to the photos files on the computer and then begin the photos transfer from computer to iPhone within simple clicks. We have introduced three different ways of coping photos from iPhone to computer, which one do you like? Actually, no matter what is your final decision, we only want this page will help you lots. If you're prefer to the method two, then don't hesitate to try it now.